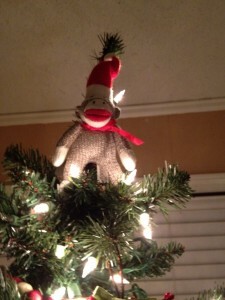 This little sock monkey ornament came along around the time Matt and I got married (or maybe even before). For the last 10 years he has held the place of honor on our tree each Christmas. You might think there are no ornaments on the bottom 12″-18″ of our tree to keep little hands off of them. That is not, however, the case. Once upon a time, there were ornaments in that area, but the little hands have moved them higher. 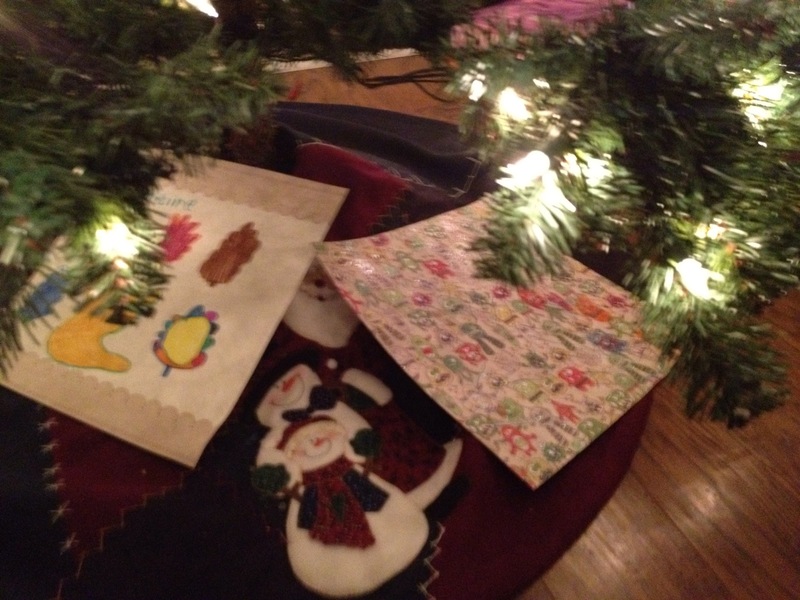 There are no gifts under our tree, but there are these two random pictures that E and J put under there last week. J’s is drawn on monster-print scrapbook paper. E’s is a handprint and leaves. Yep, his name is Hanky Panky. Nope, I have no clue why. This little guy is a relic of my childhood. He always graced a shelf at my grandparents’ house as well as one at my parents’ house. When Matt and I got married my grandmother made one for us. 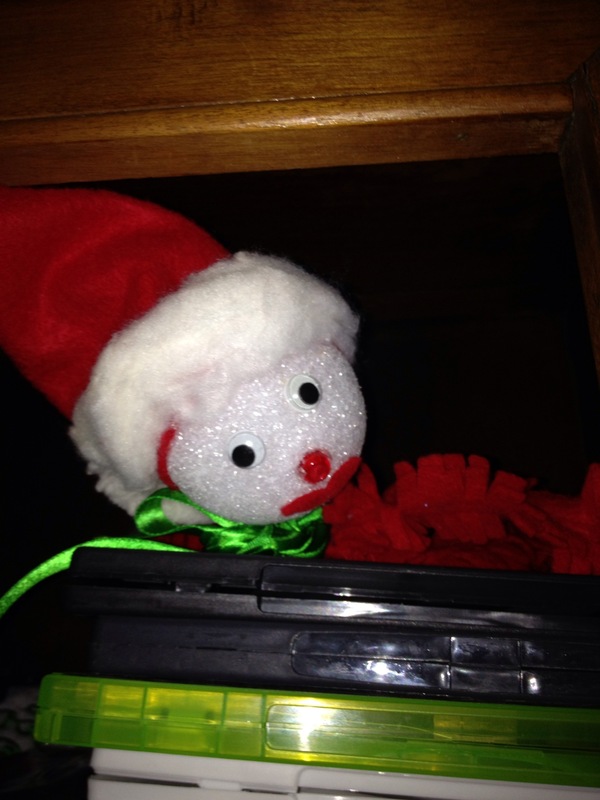 I like to think of him as the original Elf on the Shelf. Matt and I came into our marriage each having a handmade stocking (his made by his paternal grandmother, mine made by my paternal grandmother). It was also a tradition in my family that new grandmothers would make stockings for their grandchild’s first Christmas. 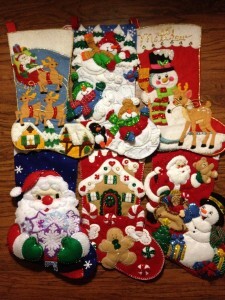 Therefore, my four children have stockings handmade by my mother (thanks, Mom!). 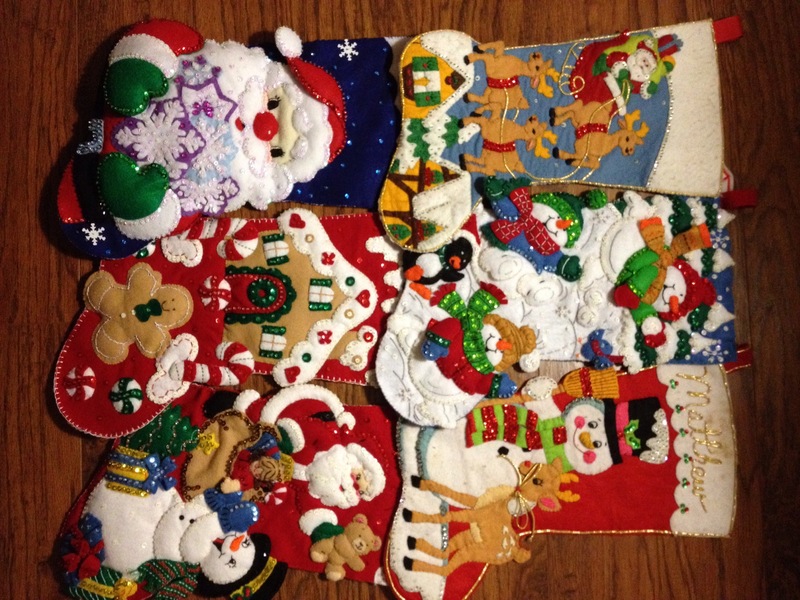 The stockings belong to (top row, l to r) me, S, Matt, (bottom row, l to r) M, J, E. These are one of my favorite Christmas traditions. 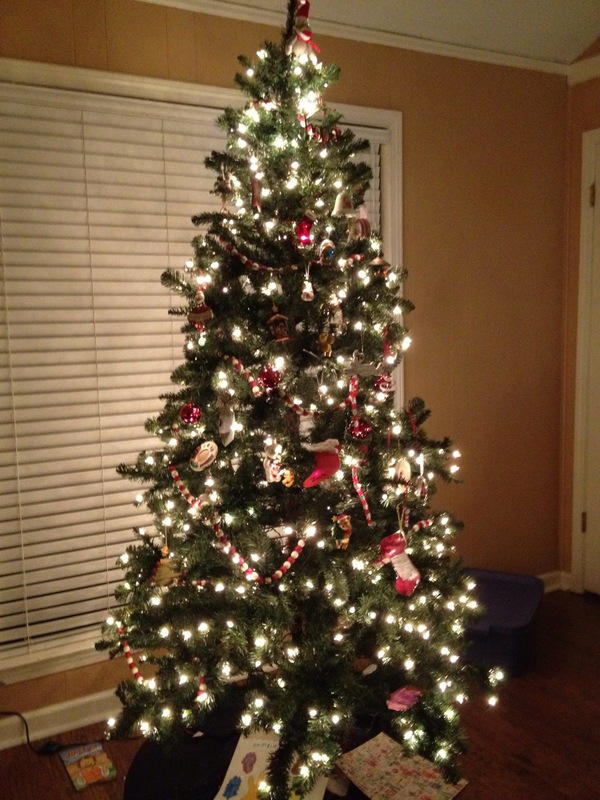 Now that you’ve glimpsed our Christmas quirkiness, what Christmas quirks do you have at your house? 31 Days at Bits & Pieces From My Life – A delightful series filled with insight and encouragement for young moms (and moms of young). Kids Bored Yet? at It’s Almost Naptime – Ever wondered what swaddling clothes really are? Take a look at the first picture in Missy’s post. Pretty neat. Christmas vs. Christmastime at Vita Familiae – interesting food for thought. The One Thing Your Christmas Can’t Afford to Be Without at A Holy Experience – “And if there is no cross in my Christmas, then my Christmas has lost Christ, and what is the manger if it not for the Messiah, the one who saves us with the scars?” Love, love, love this post! Imagine you are selected to receive Britax products and other great goodies in return for sharing them with your friends and writing reviews of the products. Yeah, I was excited, too! Thanks to MommyParties for choosing me as a host of MommyParties sponsored by Pregnancy 2.0! 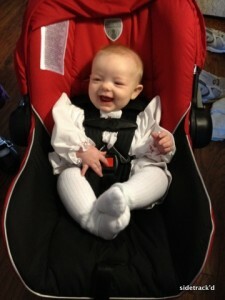 As a host I received a Britax B-Agile stroller, a B-Safe infant car seat, and the Britax baby carrier with seat extender. 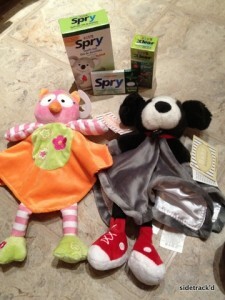 I also received a BabyPlus prenatal education system, loveys from Snuggle Buddy, and a box full of Spry and Xlear goodies to share with my friends. I took my goodies to my Bunco group to share with several of my mommy and mommy-to-be friends. Unfortunately, I didn’t think to take any pictures as we checked out the stroller and infant car seat and tried on the baby carrier. Everyone was impressed with the functionality of the gear and really liked the aesthetics of the stroller and car seat. 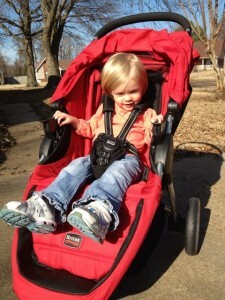 I was thrilled to have the opportunity to review the B-Agile stroller. I’ve wanted a single stroller for a while now. Something that was light weight (although that isn’t hard to do when compared to my double behemoth), easy to steer, and nice looking (yes, I’m a bit shallow when it comes to baby gear). This stroller meets all of those criteria and many more. Designed for Moms on the go, the B-Agile has the look and feel of a jogging stroller. It is very light weight (16.5 lbs) and steers great. I can steer this stroller one handed (even with the infant car seat attached) while carrying the toddler on my hip. It’s wonderful! There are several other features that I really like about the B-Agile stroller. It has an easy one-handed fold which works very well. The small profile of this stroller makes it easy to maneuver in stores, and it even fits in the back of my van unfolded! With a fully reclining seat (infinite recline positions) and a no-rethread five point harness it is simple to adjust the stroller to use with any of the children. The frame is designed to accommodate stride which is great when Matt is using it, no cross-bar to kick. And the canopy is HUGE (which I love!). While I really like the B-Agile, there are a few things that I’m not wild about. I didn’t find the one-handed fold to be intuitive. If you read the manual, it clearly states that you press the frame release button and then pull the strap in the seat to fold the stroller. I, however, did not read the manual before using the stroller the first time, thus my knowledge that it fits in the back of my van unfolded. Now that I know what to do it is simple to fold. No big deal. I do wish the basket was a bit larger. It is adequate for holding my (large) diaper bag, but just barely. But my biggest issue was that the harness release mechanism on ours seemed ridiculously difficult to undo. I had to squeeze the button as hard as I could and pull the buckle at the same time. I spoke with Britax customer service about this issue, and they were great; very professional, courteous, and helpful! The CS rep assured me that the buckles were designed to be stiff so little ones can’t escape (which I appreciate) and that they should loosen up over time. As we continued to talk and I explained how hard they actually were to open she was quick to offer to remedy the problem. The next business day a new seat was shipped to me so the buckles would work more easily. I was super impressed with how knowledgeable the CS rep was and how great Britax was to work with! Overall, I am very pleased with the B-Agile stroller. It is great for strolling the toddler (23 months), the infant (4 months), or even one of the older kids (3.5 y/o and 5 y/o). The B-Agile stroller and B-Safe car seat work great together. The car seat attaches and detaches easily and sits securely on the stroller frame. I also like that I can put up the hood on the car seat and the vented hood on the stroller and have M completely covered. And let me tell you, the B-Safe infant car seat came at just the right time. Baby M had never ridden in an infant car seat (we installed her convertible seat before we went to the hospital), so I intended to give this one away. However, the weekend before my party the harness adjustment mechanism on S’s car seat broke and could not be fixed. Since we had the B-Safe seat on hand, we moved S into M’s convertible seat and installed the B-Safe for M’s ride. We put M directly into a convertible because we really don’t use the carrier feature of an infant car seat all that often. I will say, though, that having one has been nice on several occasions. The B-Safe seat is comparable to other infant car seats in weight and ease of carrying. It was easy to install with the LATCH system in our van, and it has multiple base positions to help it fit in any car. I really like that it has level indicators on both sides of the seat, so much easier when installing than having to move to the other side of the car to make sure it is level. And it attaches and detaches with the base nicely. Best of all, M seems comfy and secure in there. Now I will fess up and tell you right off that I haven’t actually worn M in the Britax baby carrier a whole lot. If you know me, you know I own multiple baby carriers and have plenty of opinions on babywearing devices. The lack of use, in this case, isn’t from any intrinsic dislike, but just because it is hard to set aside my favorite carriers to try a new one. However, after using it at the grocery store on Friday, I will definitely be using it more! A few features I really like on this carrier: it is easy to get on and off, it has excess belt storage bands to prevent loose straps, the instructions are printed on the interior of the carrier, and the straps seem to be well padded for comfort in extended use. I am not a proponent of forward-facing babywearing or rear-facing babywearing where baby’s legs “dangle” and they are not positioned in a way that is similar to sitting down (weight primarily focused on their bottom). I really like that Britax has developed a Seat Extender Insert which allows their carrier to hold baby in a “sitting” position. The insert makes it function similar to an Ergo or Boba in the front carry. I do wish that the extender insert came with the carrier instead of being sold separately. Because M was already here when I was chosen to host this party I was unable to personally try the BabyPlus Prenatal Education System. I have, however, passed it on to a friend to use. I’m really curious to see if she notices a difference with her baby girl. While I’m a bit skeptical (by nature), I find the whole idea interesting. For more details on the system and its benefits please visit the BabyPlus website. Have you heard of the benefits of xylitol? While I knew that it was good to chew gum with xylitol I never really knew why. Come to find out, xylitol fights bacteria. Now there is not only gum containing xylitol to help prevent tooth decay and gum disease, but nasal saline spray containing xylitol. Xlear generously sent Spry infant/kid’s tooth gel, Spry gum, Xlear kid’s nasal spray, and Xlear adult nasal spray to share with all of my party goers. We’ve used the tooth gel with S and it seems to work fine. The word on the gum (from a friend) is that it is good but loses flavor quickly. I’m excited to use the nasal sprays as I know of a few people who swear by Xlear to prevent sinus junk. I will definitely use it to try to stave off my semi-regular sinus infections! And last, but certainly not least, we received two adorable loveys from Snuggle Buddy. These loveys are so soft that I know M will love them. The bright colors and cuddly fabrics are appealing to both mom and baby, and the great design and quality will definitely attract mom. I can’t wait for M to snuggle with her precious little owl! If you made it to the end of this post, you definitely deserve a reward. I apologize for the wordiness, but with such a generous hostess package I wanted to thoroughly review the products offered. I am grateful to MommyParties for the opportunity to try out these great products and share them with my friends! I’m not much of a cold weather person (Matt is laughing right now). In fact, I’ve mentioned a time or thirty that I would prefer to live south of the Tennessee/Kentucky border for the entirety of my life. Now, don’t get me wrong, I do sometimes dream of living in beautiful New England or maybe Minnesota…but only during the Summer. Why do I dislike cold? Well, it could be because I’m pretty much cold all the time. But I’ve recently decided that my number one, all-time reason for disliking cold weather is coats! “Coats?” you say. Yes, coats. Let me explain. I have four children and two arms. I have a baby (almost 4 months) and a toddler (almost 23 months) which means I almost always have one diaper bag with me and often two. I’m often found wearing someone and/or pushing someone while trying to hold two or three hands. And my children are children; meaning they don’t like to deal with their own belongings. Coats are just one more thing to keep up with. 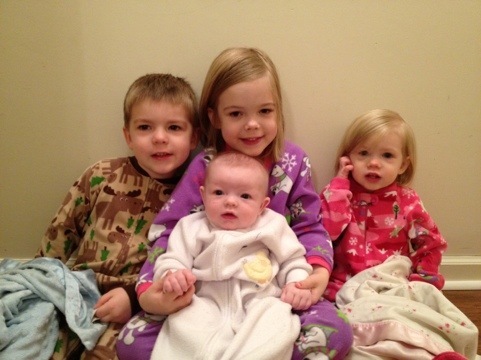 Like four children to keep up with isn’t enough in and of itself. And not only do I have to keep up with coats, I have to add ten minutes to our “get out the door” time in order to get everyone into their coats. Then there is the terrible hassle of buckling them in car seats in coats. Or taking coats off when we get to the car and putting them on again when we reach our destination. 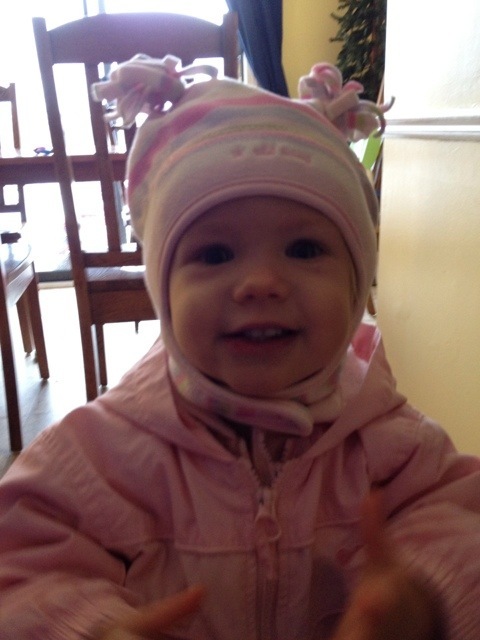 When it’s cold enough that we need hats and mittens? That not only adds to the hassle but multiplies it exponentially! So if I tell you we can’t go somewhere this winter, it just might be because it would require us to wear coats. You are currently browsing the Sidetrack'd weblog archives for December 2011.